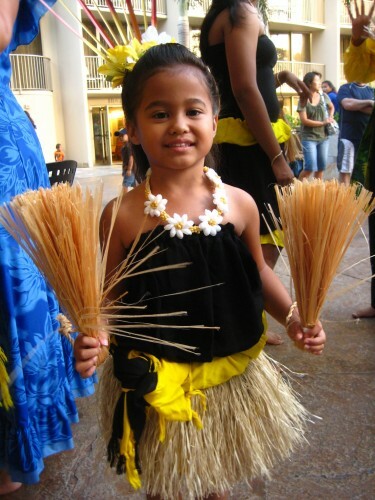 According to legends and oral traditions, Waikiki was the seat of the Oahu kingdom. 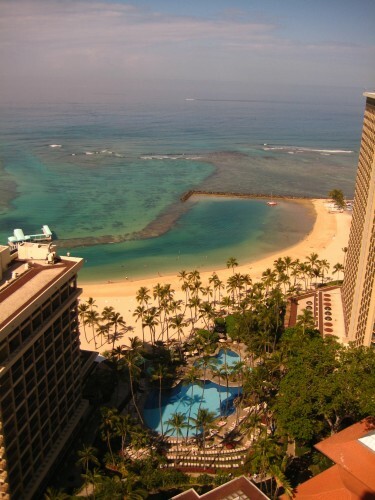 Kawehewehe, where Embassy Suites Waikiki Beach Walkis located, was also known as a place for spiritual healing. While our son limped around on crutches from a prior accident and my husband gradually detached from his cell phone umbilical cord, I can say that the Embassy Suites was a place for healing from work place overload. Upon arrival, we were welcomed with mini fresh fruit drinks; perfect for a main-lander attitude adjustment. 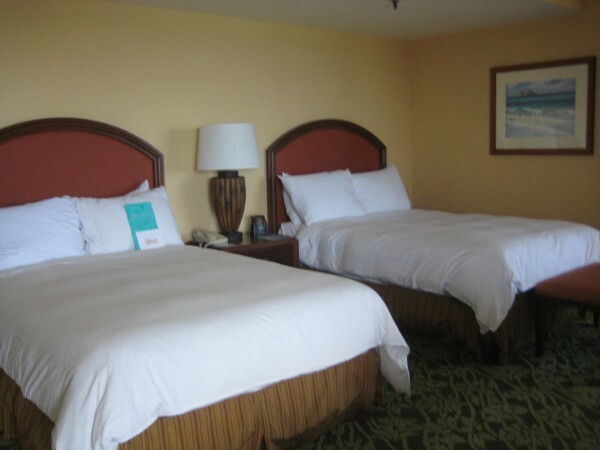 Our two bedroom suite in the Aloha Tower was ideally arranged for two teenagers and two adults. After a day of horseback riding on the North Shore, we made it in time for the Manager’s Reception, held daily on the 4th floor from 5:30-7:30 p.m. My husband and I enjoyed complimentary mixed drinks – mai tai, anyone? The kids were happy with unlimited refills of chips and soda. The hula dancers were an unexpected bonus to a nice evening. That evening we looked out on our balcony to the Friday night fireworks exploding in the sky next to Hilton Hawaiian Village Resort and Spa. Our two bedroom suite, #1402, rented for $439 and included the Manager’s Reception and a full hot breakfast with made to order omelets in the morning. My husband appreciated the in room coffee maker, the kids loved the flat screen television in their own room and easy beach and shopping access, I enjoyed the free Internet, Bloom bath amenities and having my own balcony. While I’m not a power shopper, the Embassy Suites is located next to the Royal Hawaiian Center, home to numerous restaurants such as Doraku Sushi. There is also a food court located within the center for quick, affordable meals. During my visit to the Royal Hawaiian Center, the Polynesian Cultural Center dancers performed. I also happened to be in Oahu during the Na Hoku Hanohano Festival.The Royal Hawaiian Center was a venue for one of the free musical events scatter about Waikiki leading up to the Na Hoku Hanohano Awards – Hawaii’s version of the Grammys for locally produced music. Article written by and photos courtesy of Travel Writer Nancy D. Brown of What a Trip I was a guest of Embassy Suites Waikiki Beach Walk and the Hawaii Visitors Bureau. As we pulled our rental Jeep into the Hilton Hawaiian Village driveway, the two teenagers in the back seat actually unplugged from their iPods momentarily and shared a word or two. “Nice” said the 18 year old. “Sweet” added the 14 year old when he spied the waterslide and Waikiki beach beyond the swimming pool. Our room, an Executive Double, with balcony, two double beds and a sofa pull out bed, was the equivalent to a room and a half. Traveling with two teenagers, the extra space and additional sink and mirror before the actual bathroom were appreciated. We also liked the mini-refrigerator and the in-room high speed internet. Our room, #3029 in the Tapa Tower, ranged in price from $325-$659, depending on time of year. As always, check the internet or follow Hilton Hawaiian Village on Twitter for their best rates. While I didn’t check out the children’s Penguin Program at the Hilton or the full service spa, teenagers will find plenty of activities to keep themselves occupied. Everyone from children to adults is given a wrist band to use at the water park area. If you have a chance to dine at the Hilton Hawaiian Village Tropics Bar and Grill, I recommend the fish and chips. Our teenagers will vouch for both pizzas on the menu and give the frozen tropical drinks a huge thumbs up. My teens tanned, or should I say fried themselves to a coral pink color that matched nicely with the pink flamingos that live at the front entrance to the Hilton Hawaiian Village. They also swam and snorkeled at Kahanamoku Beach and enjoyed the freedom they had of walking the 22 acre beach front resort. They were signed up for surfing lessons the next morning, but were too sun burned and had to cancel. Repeat after me – sunblock! By the way, Kahanamoku Beach, situated at the Hilton Hawaiian Village, was just named to Dr. Beach’s Memorial Day list of top beaches. Tips: There is no charge at the Hilton Hawaiian Village Resort and Spa for children 17 and under in room with parents. Friday night watch the Fireworks from your room. Article written by and photos courtesy of Travel Writer Nancy D. Brown of What a Trip I was a guest of Hilton Hawaiian Village. While most folks are looking to escape from behind their desk and leave their cell phones on mute during vacation, in truth, they want a little luxury with their horseback riding adventures. There are many types of dude ranches available to the wanna-be cowboy. If you are looking for a massage after your horseback ride and upscale, romantic lodging, a trip to Triple Creek Ranch in Darby, Montana is an option. Themed weekends designed for wannabe wranglers through cowboy round-ups and cattle drives, as well as artists and photographers are available. An Orvis-endorsed fly fishing resort, Triple Creek Ranch offers fly fishing on the Bitterroot River. Hiking and horseback riding through the Bitterroot National Forest offer views of area wildlife. Tennis, a fitness center, and a heated pool are available on-property. For relaxation, a massage in the privacy of the guest cabin and a hot tub soak among the Ponderosa pines make inviting options. The 18 luxury cabins have recently been renovated and redecorated, as has the main dining room. Cabins feature new fireplaces, new furnishings, and original pieces of art from owners and collectors Barbara and Craig Barrett’s western-genre collection. Triple Creek Ranch puts serious emphasis on gastronomy and service. The resort features an expansive dining room and bar, a chef’s table with views of the Bitterroot Mountains, and a climate-controlled wine cellar. Rated the #1 US hotel in Travel + Leisure’s 2009 “T+L 500″ as well as the #1 US hotel for service and # 3 hotel worldwide by Travel + Leisure in 2009, Triple Creek Ranch is a Relais & Chteaux member property and an Orvis-endorsed fly-fishing lodge and resort. Set against a backdrop of the Montana Rockies, Triple Creek Ranch is an all-inclusive luxury getaway for couples seeking rest, romance and outdoor recreation. Accommodations in 23 luxury log cabins with fireplace (most with private hot tub); all meals, snacks and beverages (including hearty breakfasts and multi-course candlelit gourmet dinners with house wines and cocktails) are all included. Children 16 and over are welcome. 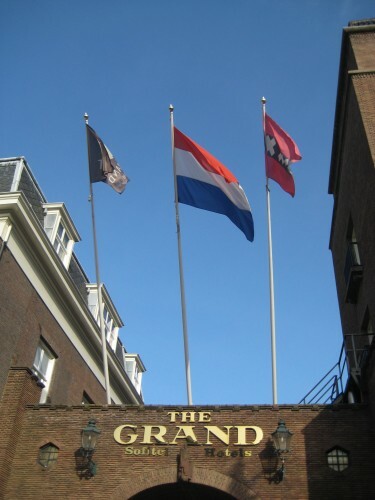 Sofitel Amsterdam – How Grand is Grand? Celebrating a special occasion or considering renewing your marriage vows? The 16th century Amsterdam Grand Hotel is just the ticket. 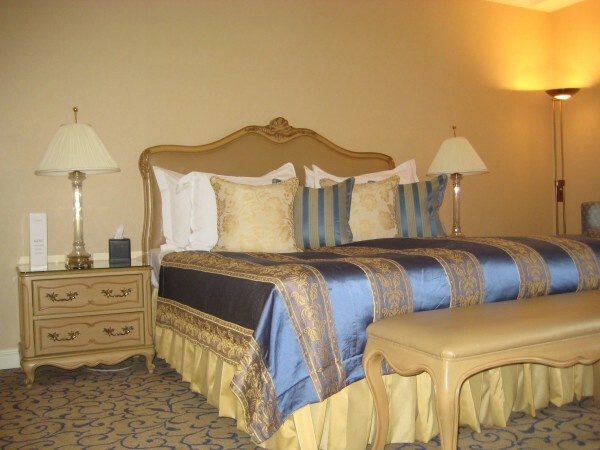 The luxury hotel recently underwent a complete renovation and is looking – grand! While the marriage chamber is reserved for royalty – Her Majesty Queen Beatrix was married there – guests will feel like royalty in this historic building. 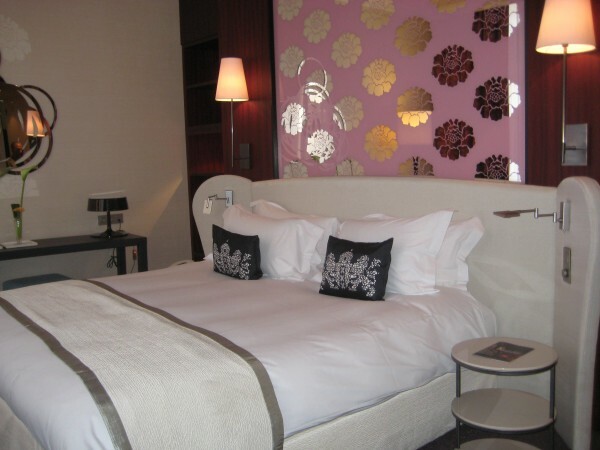 With views of the canal, courtyard or inner garden, each room at the Sofitel Amsterdam Grand is unique. From superior twin rooms to Emperial Suites, all 177 rooms at the Sofitel Amsterdam Grand are uniquely individual. Many rooms over look the canal and all 52 suites offer butler service. Families will appreciate connecting rooms and pet-lovers will be happy to pay a small sir charge for Fido to receive the royal treatment. What exactly qualifies a Sofitel hotel to legend status besides a fabulous location? Article written by and photos courtesy of Travel Writer Nancy D. Brown of What a Trip. 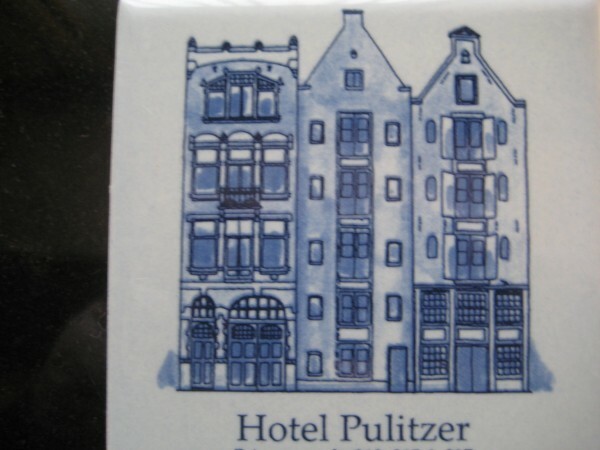 While Stroopwafels are left for guests in the hotel rooms, don’t expect cookie cutter, look-alike rooms at Amsterdam’s Hotel Pulitzer. Instead, Dutch history and culture play out in each of the 230 guest rooms at this centrally located property. 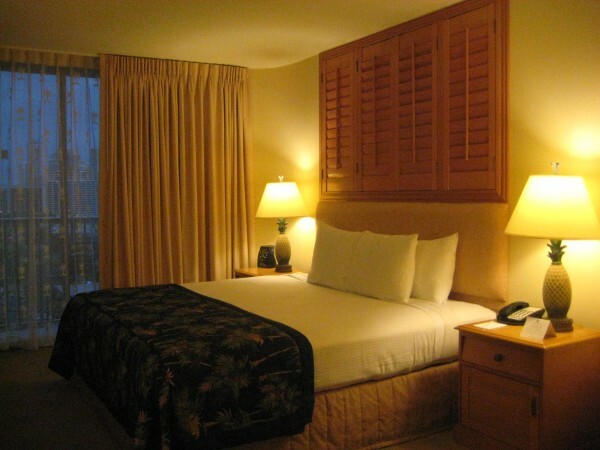 All rooms have recently been remodeled, many with hardwood floors and heated marble bathroom floors. I particularly enjoyed the tiled artwork in the bathroom. The Pulitzer Hotel Amsterdam consists of twenty-five historical canal side houses dating back to the 17th and 18th century. 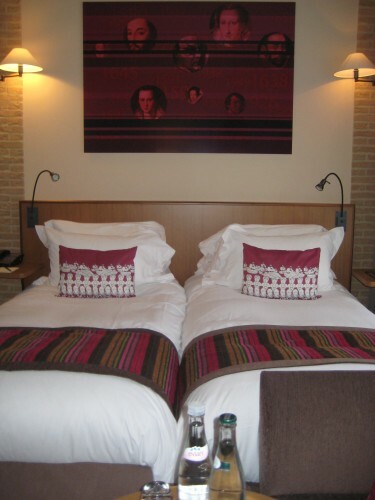 Consolidated into a five-star hotel situated alongside the Amsterdam canals, the hotel is minutes away from the Anne Frank Museum and the Western Church where Frank was said to listen to the chimes of the church bells. In addition to excellent walking paths, Amsterdam is home to many museums including the Jewish Historical Museum, the Hermitage Amsterdam and outside Amsterdam in the Hague is the Mauritshuis. At the beginning of the seventeenth century, the area where The Pulitzer Hotel Amsterdam is located was not yet built. In 1614 commissioners of the new fortification started allocating the plots of land in this block. Situated between the Keizersgracht, the Prinsengracht and the Reestraat, the façades of all the houses and most ground floor entrance corridors along the Keizersgracht, as well as the Saxenburgzaal (now one of the hotel meeting rooms ) and staircase of the Saxenburghuis are listed monuments, registered with the society for the preservation of monuments. The apothecary room of the restaurant is one of only two original 17th century shop interiors remaining in the city. While the Hotel Pulitzer may be historic, the property offers high speed internet access in all public areas and guest rooms. There is a fee of 19 euro per day for high speed internet access, thus my review of this property is not appearing until I’m back in the States. The hotel also features a Grill Restaurant and large courtyard garden on site. A member of Starwood Hotels and Resorts since 1995, Hotel Pulitzer joined the Luxury Collection brand of Starwood Hotels & Resorts in 2000 after a complete renovation. 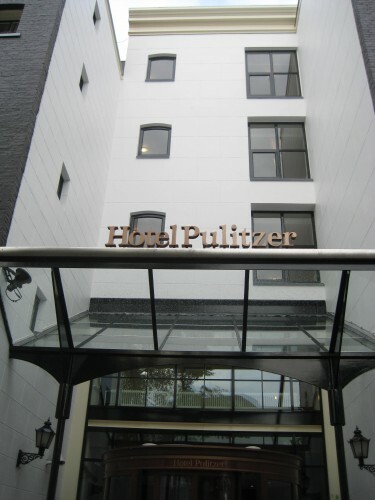 Social media fans may follow Hotel Pulitzer Amsterdam on Twitter or Facebook. Article written by and photos courtesy of Travel Writer Nancy D. Brown of What a Trip I was a guest of Hotel Pulitzer. It was the beginning of high season in Bruges, Belgium. Fortunately, our group of travel writers had reservations at the Grand Hotel Casselbergh, as most hotels were fully booked in early May. 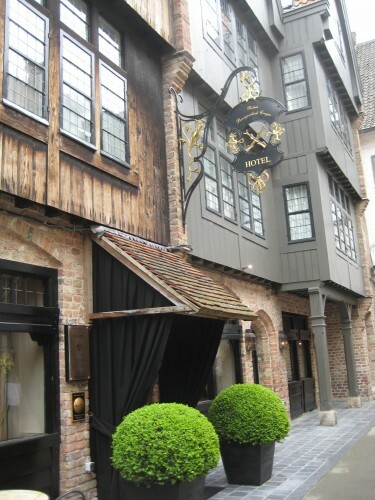 The hotel has been created out of three historical residences, resulting in 118 hotel rooms, combining 18th century Bruges with modern luxury. Everyone told me that I would love Bruges, from the canals with swans gliding by, to the lace, tapestry and chocolate shops dotting this charming town. They were right. Not only is Bruges a UNESCO world heritage city, it is an easy city to navigate on foot or bicycle and holds plenty of history. It’s also a wonderful location for photographers of any skill level. We were in Bruges to witness the Holy Blood Procession, a festive cultural parade of sorts with the majority of the towns people participating in this religious procession. Located on Hoogstraat 6, the Grand Hotel Casselbergh looked over one of the many canals threading its way through Bruges. Our four star hotel had a great wellness center. However, I can’t image why guests would not take advantage of the wonderful walking and bike routes along the canals. My room, #2409 was small, yet efficient. On this particular visit, the service did not represent a four star experience. I did not receive my wake up call and several of my colleagues were treated as more of a nuisance than guests of the hotel. If you are planning a visit to Bruges, rent the self-titled movie In Bruges. You’ll see the Relais Bourgondisch Cruyce, where Colin Farrell stayed in the movie. 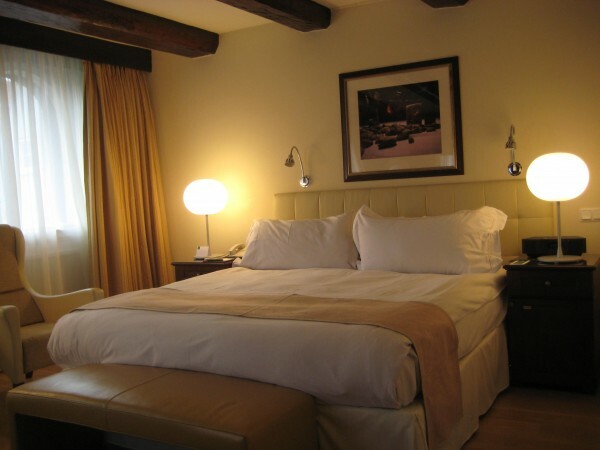 Nearby, the Hotel de Tuilerieen is where Farrell actually slept as a visitor while filming In Bruges. Article written by and photos courtesy of Travel Writer Nancy D. Brown of What a Trip. I was a guest of Grand Hotel Casselbergh. I’d never slept in a brothel before. That is, not until my arrival to Ghent in Belgium. How do I know that the Marriott Ghent was once a brothel? There are two swans adorning the outside of this beautiful historic, 150 room hotel. One swan on the outside of the building represents a brewery; two swans – a brothel. Who knew? 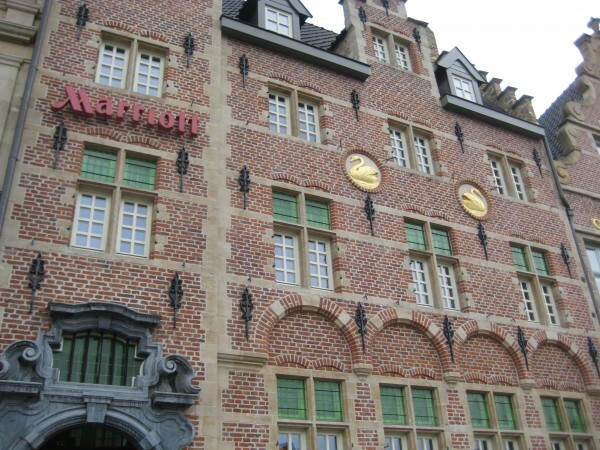 Marriott Ghent combines the best of old and new in historic Belgium building. Everyone has heard of Bruges, Belgium, yet there is a lot of history to be found in the nearby city of Ghent. Overlooking the Korenlei on the banks of the river Lys canal, the three year old Marriott Ghent seamlessly combines the old with the new. The centuries old building is a treasure to the citizens of Ghent and they are proud of their history and historic buildings. The Marriott Ghent has successfully married old brick walls, while featuring a glass-sided lobby to let the sunlight of Ghent stream in. Belgium's Marriott Ghent lobby combines the old with the new. My room, #306, a quality room, went for 306 Euro during a May 2010 stay. If you are looking for a canal view, Room #331 offers a good view of the canal. Those on an expense account or with plenty of Marriott points may opt for the Junior Suite with a canal view at 425 Euro. Breakfast, served from 6:30 – 11 a.m. in the half-timbered restaurant had a combination of hot and cold offerings. 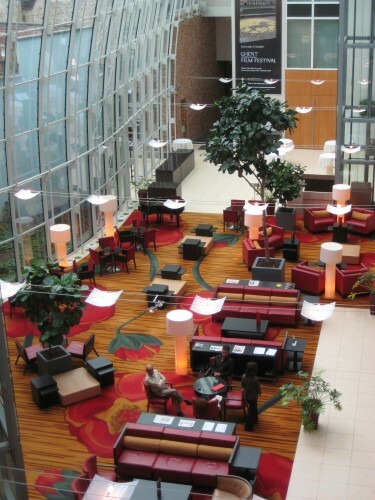 The smoke-free Marriott Ghent has two handicapped accessible rooms, a business center and small gym for working out. If you arrive by car, Marriott Ghent offers underground parking for 19 Euro daily. 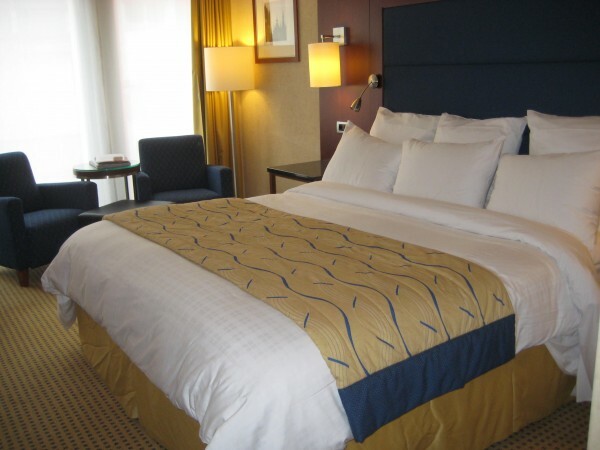 Social media guests will find the Marriott Ghent on Twitter. You may also follow VisitFlanders on Twitter and become a Facebook Fan of Visit Gent for more information on the area. The Marriott Ghent is located steps from the Grand Meat Hall, a place where meat was stored and traded back in the middle ages. It’s also close to charming shops such as the famous mustard shop. When in Ghent, make sure to sample the Gentse Waterzooi soup, Belgium chocolates and stop at the St. Bavo Cathedral to view the Adoration of the Mystical Lamb. Article written by and photos courtesy of Travel Writer Nancy D. Brown of What a Trip I was a guest of Marriott Ghent. 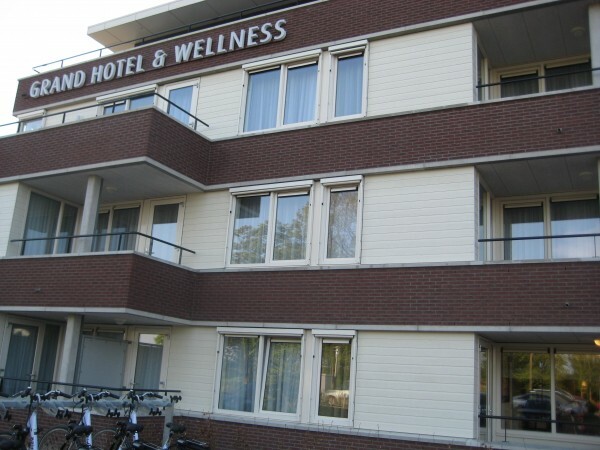 Not far from Yerseke, Zealand’s Hotel de Kamperduinen bills itself as a wellness hotel. General Manager Kevin Strubbe says the concept of the hotel is to come to the seaside and relax. Besides relaxing, there are many things to do in Zealand.By the way, the area is spelled Zeeland in the Netherlands. 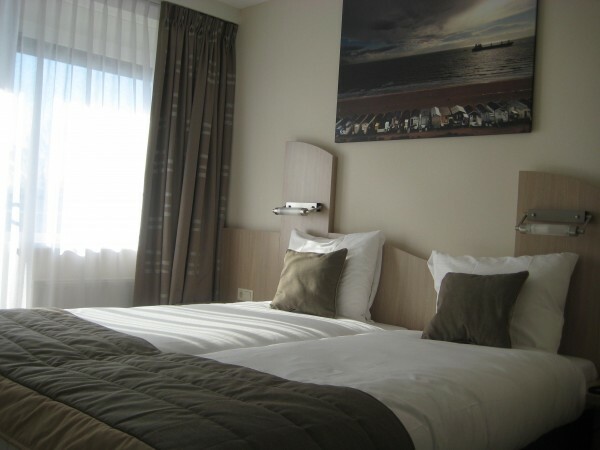 Opened April 1, 2010, the Amadore Wellness Hotel de Kamperduinen is Zeeland’s newest four star hotel. Still a work-in-progress, the Amadore Wellness Hotel de Kamperduinen includes 54 deluxe rooms and 24 suites. The hotel was built with the latest techniques in energy efficiency and sustainability. If you are visiting the seaside, yet not staying at the hotel, the wellness pool, hot tub and sauna are open to the general public, as is the restaurant. Families will like the one and two bedroom apartment features that come with a kitchen and dining area. My apartment room for two, #310, rented for 229 Euro and came with a balcony to sit outside and take in the sunshine.. A Royal Room currently rents for 149 Euro. As always, check the website for the best rates and package offers. The beach is accessed an easy ten minute walk where biking and walking paths lead the way to the North Sea. Bicycle enthusiasts will appreciate that the Hotel de Kamperduinen offers electric and manual pedal bicycles to their guests. Capitalizing on the Wellness theme, it is recommended that your pets be left at home. However, if you bring your laptop computer along, the hotel offers free internet access in all of the 78 rooms. While not a wellness or spa menu, the Hotel de Kamperduinen offers a nice dining venue on property. Being from California, I was suprised that the wellness hotel didn’t offer environmentally-friendly bedding and towel exchange options. General Manager Kevin Strubbe said signage for the rooms was on the way. Article written by and photos courtesy of Travel Writer Nancy D. Brown of What a Trip I was a guest of Amadore Wellness Hotel De Kamperduinen. Located on the famous Avenue Louise, the Conrad Brussels is one of Belgium’s top luxury hotels and is THE place to stay in Brussels. 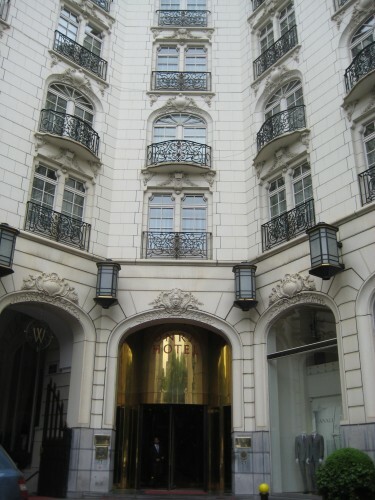 Easily accessible to the Palais Royal and Grand Place, the Conrad Brussels is an ideal location for visitors looking to stroll this elegant capital. Opened in 1993, the hotel has preserved its 19th century facade, while offering 20th century accommodations. The Conrad Brussels features large marble bathrooms with bath and separate shower, digital TV (although you won’t need TV with all of the museums nearby) high speed internet, (for an extra fee) mini-bar, a large work table and luxury toiletries. Offering 269 luxury guest rooms, including 39 suites, and two rooms for the disabled, the Conrad Brussels is family and pet friendly. 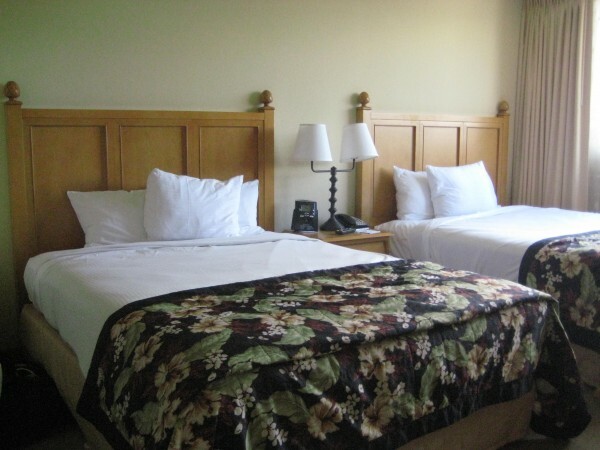 The hotel offers connecting family rooms and all rooms are pet-friendly for an extra fee. While 99% of the hotel is smoke-free, smoking is permitted in first floor rooms. The Conrad also features Cafe Wiltcher’s for guests wanting to dine in-house. For those needing to check e-mail, The Conrad Brussels has complimentary computers available at the business center. Personally, I like the Conrad for its goose down feather duvets and the free shoe shine service. My deluxe room, number 623, was on the top floor and looked over Avenue Louise. 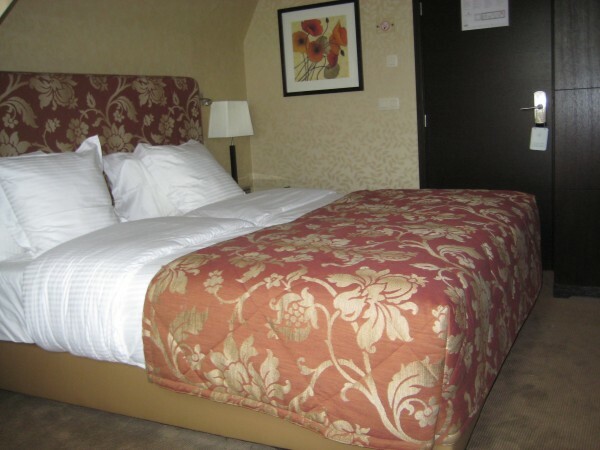 The rack rate for this room was 550 Euro, however, check the website for the best available room rates. Guests may enjoy the spa facilities, fitness room and swimming pool. If you have time, book a one hour Aroma Massage (90 Euro) followed with a dip in the hot tub. The aromatherapy massage was just the ticket to help combat my jet lag after an 11 hour flight from San Francisco. Article written by and photos courtesy of Travel Writer Nancy D. Brown of What a Trip. I was a guest of Conrad Brussels. Tucked in the Canadian Rockies of Yoho National Park, Cathedral Mountain Lodge will kick off the start of the 2010 summer season on May 21, 2010. British Columbia’s Cathedral Mountain Lodge is a private sanctuary with a collection of log cabins set among sheltered trees and the glacier-fed Kicking Horse River. 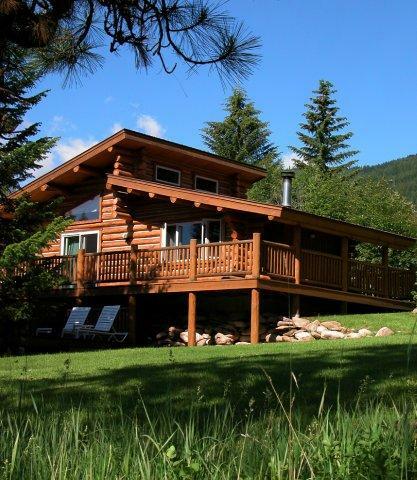 The traditional handcrafted log cabins are the definition of Rocky Mountain comfort offering fireplaces, down duvets, soaker tubs and private balconies. While I’ve yet to visit the Banff Lake Louise area, and Yoho National Park, my husband and I are planning a romantic getaway to celebrate our 24 year anniversary at Cathedral Mountain Lodge in September. To kick off its 2010 season, Cathedral Mountain Lodge is offering a Spring Into the Rockies rate for new bookings. Stay at Cathedral Mountain Lodge in your choice of cabin type for three nights and receive 20% off our regular posted rates. This special offer is available for a limited time for arrivals between May 21 through until June 21, 2010. Standard lodge pricing will recommence June 22 until the resort closes for the season on October 2. 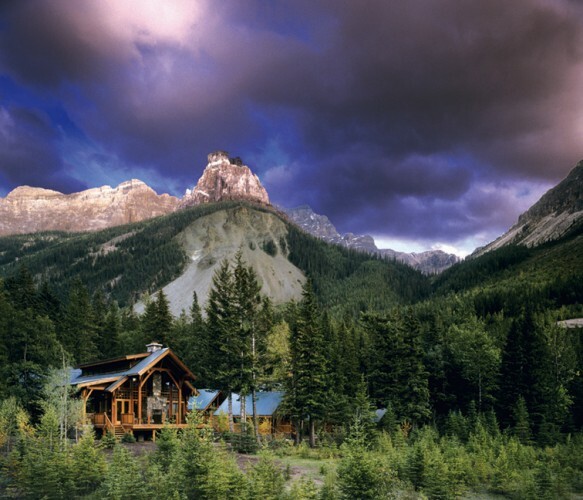 Cathedral Mountain Lodge is the perfect base camp for outdoor adventures. Canoeing & kayaking is offered for paddlers of all levels. Experience the span & views of Banff’s Rocky Mountain’s by helicopter. Explore trails leading to lakes, glaciers and summits as you hike in Banff or Yoho National Park’s 2000 km of hiking trails. Unwind with a guided fishing excursion on a lake surrounded by mountains. 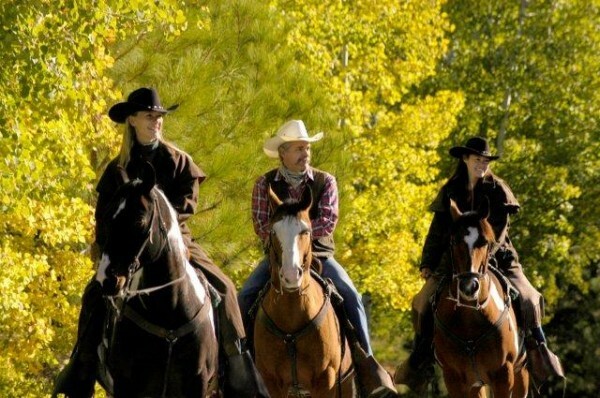 One of the most popular activities in the Rockies is a horseback ride in the hills. Or, if you are a thrill seeker, keep cool in the height of summer as you river raft down a glacier-fed river. Cathedral Mountain Lodge is part of the Capilano Group of Companies, including Capilano Suspension Bridge and Treetops Adventure in Vancouver and Moraine Lake Lodge near Lake Louise. Sardana and the Southern Albania.